A high quality minimalist glove for ventilation, control, and bar feel. Airy and wicking 4-way stretch upper. Super fit 3-panel palm follows the contour of the hand to prevent bunching and enhance ride feel. Microvent Pittards® palm resists moisture, breaths well and is durable. Microfiber wiping surface on thumb. Sonic welded wrist pull tab. Finger pull-off pockets on middle and ring fingers. Slip-on design eliminates bulky closure while still maintaining a comfortable and snug fit. Color: Highlight Yellow/Black. If you like a minimalist glove that protects your palms but doesn't compromise manual dexterity or road feel, this is your glove. I also like the velcro-free design (hate velcro on gloves! )-just slide on and slip off...I rode these most of the summer in high heat/humidity and never had any problems with blisters. Bright yellow is good, too, for extra visibility if you're riding at dawn and/or dusk. No nonsense! Great summer glove! 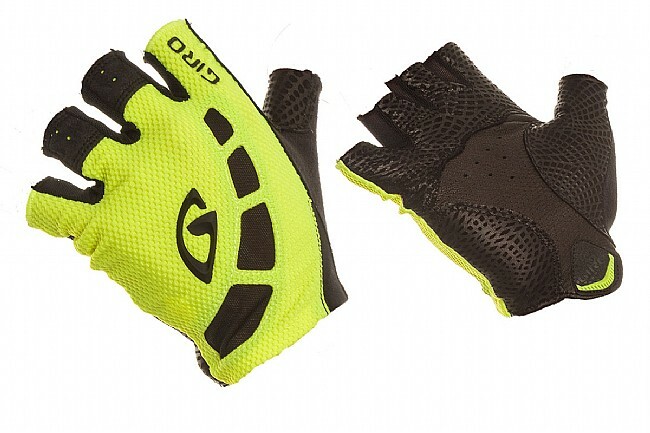 A high-tech revisit of racing gloves of old. In the age of elastomer-gel-insert multi-level-pad inflatable gloves, these are such a refreshing throwback. Velcro? No. Gel? No. Memory foam? No. These are simply a form-fitting layer of Pittards leather nice! that is snugly held in place between you and your handlebars. The back is totally ventilated and the wipe pad is super soft. No Velcro, just pull on/off. Holding up well. Light weight and bright. Good but bleeds black all over palms. Unfortunately product is spoiled by the color bleeding all over your palms after every ride even after washing. I had to return both pairs and BTD was kind enough to credit the used pair which was a customer friendly move for which I thank them and I continue to make them my primary cycling OL retailer. Great glove, well constructed and very minimal material where you don't want it. I don't find anything wrong with these gloves. I've heard good things about them, being light, breathable, and comfortable, and they are certainly worth the price. My only complaint is that they don't really absorb well when wiping my nose. DO NOT BUY. Horrible color bleeding still after washing. I am returning these and expect a credit at least. Direct should send these back to the wholesaler un less they just paid $ 1.00 each and can still make a profit ! These are merely good for protection and grip. There is no padding in the glove. So if you are looking for abrasion protection or added grip, these will do. Do not expect them to provide cushion due to lack of padding. I commute to work daily year around and believe these cloves will improve my safety. Very visible. Thats what I like. No tan lines, dye lines! I was happy at first with these gloves. Great fit. Good grip. Barely knew they were there. But after a few uses, my hands started turning black after a ride. It's gotten worse over time. Took my gloves off after a particularly long ride the other day and my hand looked like I was still wearing the gloves. Took a day to wear off. I bought these gloves for all the reasons mentioned in the review from BikeTiresDirect. There a minimalist glove, which is exactly what I like and is hard to find these days. The color will not stop bleeding, it stains my hands black after a ride, and it's come close to ruining a few cycling jerseys in the wash. Now I just wash them by hand and the amount of dye that continues to poor out is ridiculous. The funny thing is this is after weeks of use and multiple uses, strangely...I don't remember them doing this on the first few wearings? These gloves are very comfortable. The neon color glows when it is dark! Great fit and feel. Leather contoured to my palms very well. Only issue is that the black color runs a bit and has discolored the yellow uppers. Used primarily for road and mtg riding. Good fit and excellent comfort on longer days. Black coloring runs and has discolored the yellow uppers. Also, grips can get a little slippery when they get overly wet from sweat or foggy moisture. Overall good gloves for the cost. I wear a M glove. I could not get a M on in this glove. XL fits. Very little padding, but nice glove.